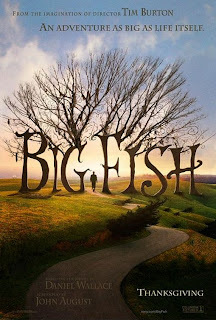 This essay will investigate the relationship between story and structure in Tim Burton’s movie, ‘Big Fish’ released by Columbia Pictures in 2003. It will examine the different techniques used, exploring camera movements, editing, the order of scenes and the integration of visual effects and how they drive the story. It will pay attention to the character development, particularly the father/son relationship between the lead characters, as well as Burton’s motivation for directing the film. This research will be referencing ‘Gothic Fantasy, The films of Tim Burton’ by Edwin Page; ‘Tim Burton, The life and films of a visionary Director’ by Helmut Merchmann; ‘The films of Tim Burton’ by Alison McMahan; ‘Film Directing, shot by shot, visualizing from concept to screen’ by Steven D. Katz and ‘Directing the story, professional storytelling and storyboarding techniques for live action and animation’ by Francis Glebas. 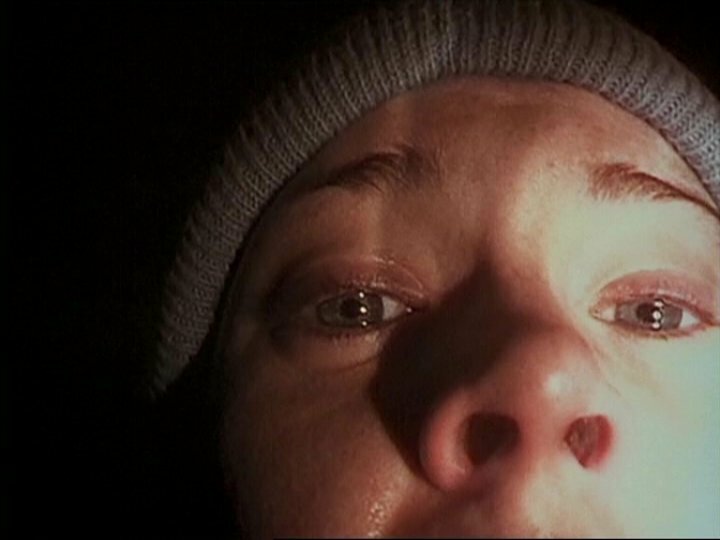 Cloverfield opens in a similar fashion to 1998's "The Blair Witch Project" with a chilling message, stating that the following footage was recovered from an SD card found at the site formerly known as Central Park. 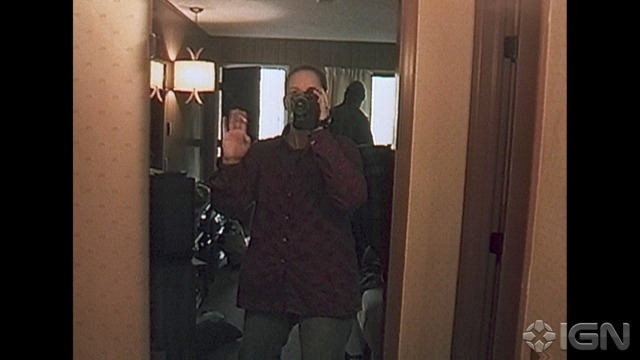 It then cuts to the protagonist Rob Hawkins (Michael Stahl-David) using his video camera, filming the morning after spending the night with his love interest Beth (Odette Yustman). The Director Matt Reeves intelligently uses the fractured recording as flashbacks to set the scene and gradually fill in the back story of Rob and Beth. The footage then cuts to several months after Rob and Beth's morning, the camera now in the hands of Rob's brother, Jason (Mike Vogel). He is on the way to Rob's apartment in Lower Manhattan with his girlfriend Lily (Jessica Lucas), who has arranged a surprise leaving party for Rob, who is jetting off to a new job in Japan. Jason off loads his responsibility to film Rob's farewell messages to 'Hud' (T.J Miller), their mutual, dorky friend who reluctantly obliges. Throughout the course of the evening, we discover that Rob has been in love with Beth since college and the night they shared with each other was a secret. This is revealed when Beth arrives with her date Travis. Beth leaves with shortly after a confrontation with Rob. Apart from unsuccessfully pursuing Marlena Diamond (Lizzy Caplan), Hud spreads the gossip of Rob and Beth between the guests. Rob consoles with Jason and Hud when the building is rocked by an apparent earthquake. They all rush up to the roof of the building for a better view. Whilst they are up there, the New York sky line is lit up by an explosion. They all rush down the stairs as a flurry of debris crashes around them. They go out into the street, bewildered. As they ponder what has just occurred, the head of the Statue of Liberty is launched down the street, smashing into buildings, eventually screeching to a stand still. 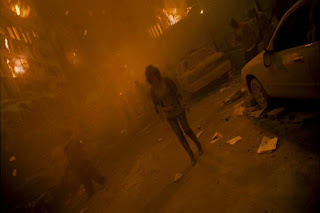 As they turn back, a building collapses and we catch a glimpse of a huge creature moving through the dust cloud. They take cover in a shop as the street fills with plooms of dust and the ground shakes from 'something' stomping passed them. The Director bravely replicates scenes of September 11th of people wondering through the smog, dazed and confused. This iconic imagery blended with handheld camera point of view makes it frighteningly real and disturbing. "Is this attack so terrifying because it has obvious shades of 9/11 or because the handheld camerawork leaves us disoriented, glimpsing the enormous creature only when Hud’s view quivers that way? It’s both. We live in a time when global violence is recorded not by professionals, but by shaky-handed bystanders with camera phones." (Richards, 2008). Rob, Jason, Lily, Hud and Marlene gather together and join the crowds of people trying to evacuate the island. They unsuccessfully try to cross the Brooklyn bridge when it is smashed by the tail of the monster and Jason is killed. Rob has a voicemail from Beth, crying in pain apparently trapped in her apartment. Rob decides that he must save her. 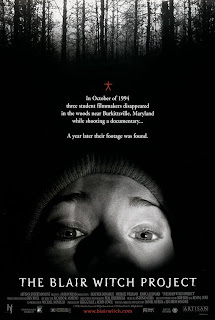 It is here that any similarities with "The Blair Witch Project" end, the remaining group join Rob and try to reach Beth. The visual effects budget flexes it's muscle as they get caught between the army battling with the monster and the parasites, (dog sized, crab like creatures) which drop from the monster and also attack humans. They reach and save Beth from her apartment which has collapsed and is leaning against the adjacent building, (another Twin Towers reference) after losing Marlene to one of the parasites. 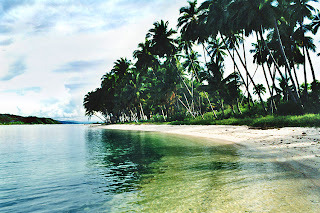 They are told by an army official that the last transport leaves at 0600hrs, after that the army will bomb the entire island to tr and destroy it. They arrive in the nick of time but Lily is separated from Hud, Rob and Beth who get a different chopper. 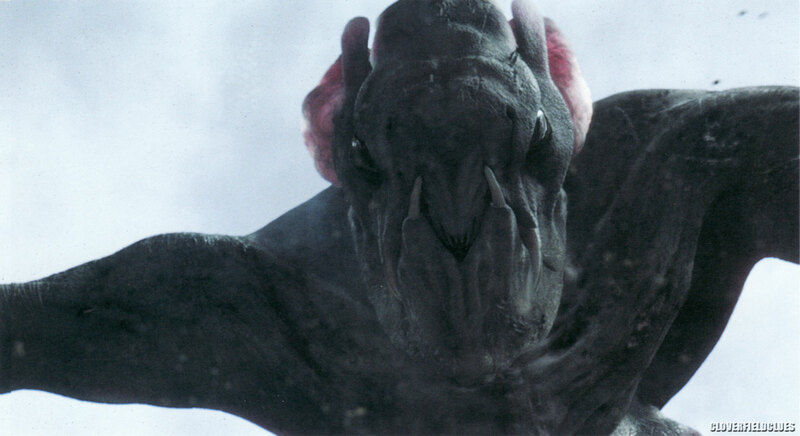 Hud continues to film the action as stealth bombers blast the creature, seemingly defeating it. However, the creature jumps from the flaming wreckage and knocks their chopper to the ground. They crash land in Central Park. As they scurry away from the wreckage, Hud is cornered by the monster. Moving back to traditional monster movies, the creature is expertly, however, unnecessarily revealed. "At long last, a lingering full-on shot of the monster is served up, and it's not a friendly sight. All the same, a strong argument could be made for not showing the creature at all. The film's initial hints at offering a new kind of horror eventually devolve into something essentially familiar, provoking idle thoughts that, in the vein of the '50s sci-fier "Forbidden Planet," it could have been more effective with an invisible but quite tangible threat." (McCarthy, 2008). Rob manages to retrieve the dropped camera escaping with Beth, hiding under a bridge in the park. 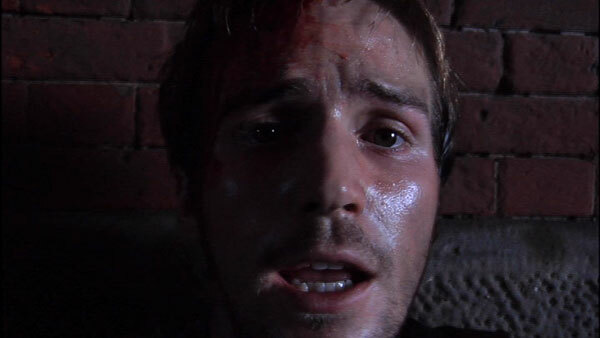 He films his final words and declares his love for Beth. He urges her to do the same, as she films her speech they are engulfed by an explosion. The camera eloquently cuts back to their day together before the events unfolded. Director Matt Reeves and Producer J.J. Abrahams used viral marketing to great effect to market the film. 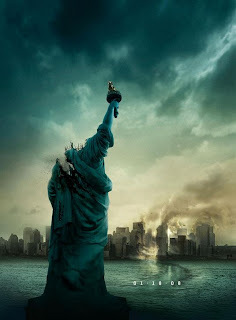 For a long time into post production, the film remained as an 'untitled project' as they released the tantalizing teaser trailer (the iconic Statue of Liberty head scene). It created a huge amount of buzz on the internet, generating alot of questions which ironically aren't answered by the end credits of the film. "...the Paramount release will be lapped up by thrill-seeking young auds everywhere for monstrous initial biz, spurred by an Internet-driven campaign that's been stoking fan interest for months." (McCarthy, 2008). 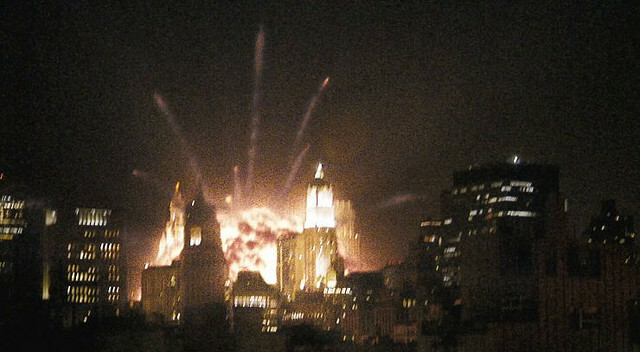 Cloverfield knowingly takes elements from "The Blair Witch Project", (the hand held point of view, the uncut, unedited style, the characters development and relationship arc through a frightening chain of events), but puts a new spin on it by seamlessly blending it with all the bells and whistles of a special effects film. The only respite from the action is ingeniously interspersed with Rob and Beth's secretive romantic day out which helps flush out the back story. "...all in all, it is an effective film, deploying its special effects well and never breaking the illusion that it is all happening as we see it." (Ebert, 2008). Heather (Heather Donahue) is the enthusiastic Director of the film. 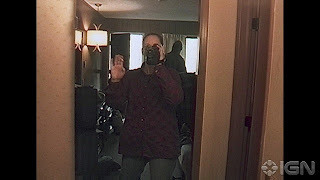 We see her excitedly getting ready in her apartment as her cameraman Josh (Joshua Leonard) arrives. They gather their equipment, a handheld video camcorder and a 16mm film camera and set off to collect Mike (Michael Williams) their sound recorder. They arrive at Burkittsville, Maryland formerly Blair. Heather narrates as they film in the towns graveyard, which has an unusually high amount of infant graves. With their first scenes in the can, they proceed into town and interview the locals about the legend of the witch. Co-directors Daniel Myrick and Eduardo Sanchez intelligently use this an opportunity to provide the audience with the background story. The interviews and interviewee's seem genuine, but told in a tongue in cheek way, like a real myth or legend adding to the realism. Roger Ebert of Chicago Sun times explains 'The buried structure of the film, which was written and directed by Eduardo Sanchez and Daniel Myrick, is insidious in the way it introduces information without seeming to.' He goes on to explain ,'We hear that children have been killed in the woods, that bodies have disappeared, that strange things happened at Coffin Rock. But the movie wisely doesn't present this information as if it can be trusted; it's gossip, legend and lore, passed along half-jokingly by local people, and Heather, Josh and Mike view it as good footage, not a warning.' (Ebert, 1999). They hear stories and myths dating back as far as the 1700's, about a woman banished from the town of Blair for luring children and drawing blood. The legend spans to as recent as 1941 when an old hermit confessed to killing children in the basement of his home in the woods. 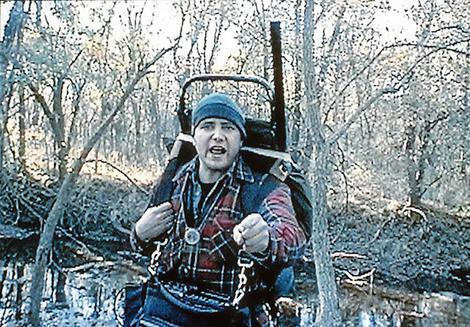 He was hung after telling the authorities he did it for an 'old woman ghost' who occupied the woods. He would make the children face the wall as he sacrifices the others. Amongst the interviewer's is Mary Brown seen as the local town nut. She is adamant she saw the witch as child and describes her as half woman, half animal. Not disconcerted by the locals stories, the three park their car on the outskirts of the woods and head off on a two day hike to film more footage. 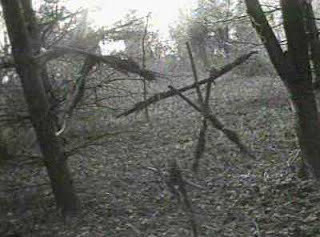 They come across locations linked to the myths, finding strange piles of rocks and sticks tied together in trees. Their first night passes without much incident. Joshua tells the group the next day he heard strange noises in the night which sounded like cackling. The pace of the film is expertly realized, raising the tension gradually. The second night, all three are awoken by the same cackling noises which seems to be coming from all directions. Clearly disturbed, they decide to head back to the car the next day, their trust solely in Heather and her map. Panic begins to slowly seep into the camp as they begin to fear they are lost. They reluctantly have to camp another night. The cackling returns along with sounds of babies screaming. Their tent is violently rustled by something outside and they run off into the darkness of the woods, where they hide till morning breaks. With each passing night, the events become more extreme. Tired, hungry and out of 'smokes', the relationship between the group begins to fray. The directors using method acting to great affect. Their fear and growing impatience feels completely believable. 'The dynamics between the three main characters, veering from intense dislike to petrified reliance on each other, makes compelling if uncomfortable viewing.' (Barclay, 2000). Their situation descends further as Joshua seems to have disappeared in the night. Heather and Mike decide to carry on, not sure if he has run away or if he has been kidnapped. They setup camp for another intense night. Heather completely breaks down and uncharacteristically apologizes on camera, blaming herself for everything. 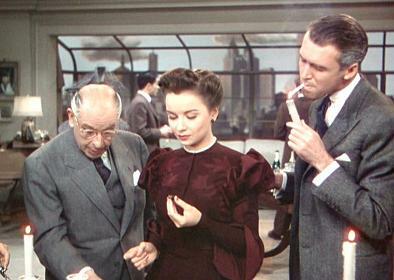 A scene which would become a signature part of the film, endlessly parodied and riffed. 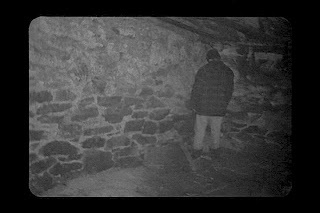 The Blair Witch Project is a remarkably affective film, famously filmed on a shoe string budget. In a time when video cameras became a standard house hold item, the audience can relate to the actors like never before and are completely submerged in their situation. They may as well be filming it themselves. The uncut editing and documentary style sell it's realism to truly frightening affect. '...the handheld camerawork - on both videotape and film - creates a real in-your-face feel that extends the mounting anxieties experienced by the characters to the audience.' (Barclay, 2000). The Directors used their limited finance to fuel their creativity, proving that a good horror need not rely on special effects. The actors adequately descend into fear and anxiety, frustrated but utterly reliant on each other. The infamous witch is never directly seen, however, her presence is certainly felt. The strange rock formations and binded sticks absolutely feel like they were made by 'something' in the woods. The extremely effective noises in the dark are scarier than the 'thing' making the noises. The Directors manage to tap into the fear of the dark / woods which is embedded in all of us, realising the imagination is far more affective than any special affect or costumed actor. '''The Blair Witch Project,'' a most inventive departure from standard horror fare, is frightening only insofar as its characters' panic seems real. Everything else is left to the imagination. And the imagination works overtime watching the acuity of these talented filmmakers, and wondering what bright idea they'll have next.' (Maslin, 1999). 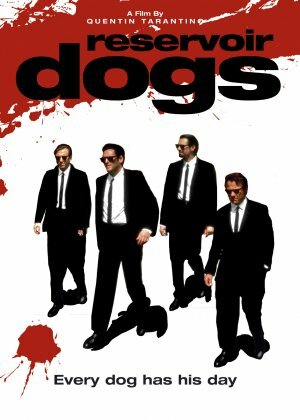 Reservoir Dogs opens in a typical American diner, introducing us to the 'dogs' before they go to their next job, a diamond heist. From the start, Quentin Tarantino demonstrates a zippy, realistic dialogue, full of street slang and profanities, discussing everything from Madonna's 'like a virgin' and local radio stations to societies obligation to tip hardworking waitresses. 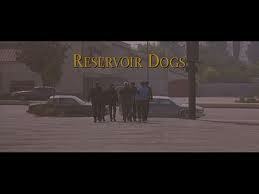 It then moves onto the infamous title sequence of the team walking to their cars in super cool slo-mo. We are then dropped right into the action. 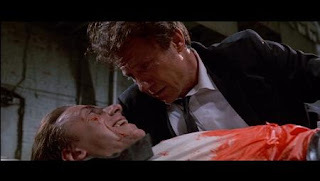 Mr. White (Harvey Keitel) is racing in a car with Mr. Orange (Tim Roth) bleeding to death in the back seat. The handheld camera movement and uncut shot adds to the panic and urgency of the scene as Mr. White almost orders Mr Orange to be ok. They arrive back at the rendezvous, an unused warehouse to meet the rest of the team. Mr White continues to comfort his partner and assure him their boss will arrange for a Docter to fix him up as he passes out in the pain. Mr. Pink (Steve Buscemi) arrives back first. Obviously riled and agitated Mr. Pink believes their 'bungled' job could have been a set-up and they have a rat in their midst. Tensions rise as they begin to reenact the chain of events and figure out who the rat is. Mr. Pink, obsessed with remaining 'professional', reveals he has the 'merchandise' stashed somewhere as he explains his escape, the camera cuts to his gritty getaway. The conversation almost boils over as they decide the fate of Mr. Orange, Mr. White feeling responsible for him, objects to dumping him at the hospital and making off with the diamonds. 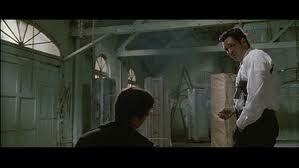 As they confront each other, Mr Blonde (Michael Madsen) returns to the hide out. 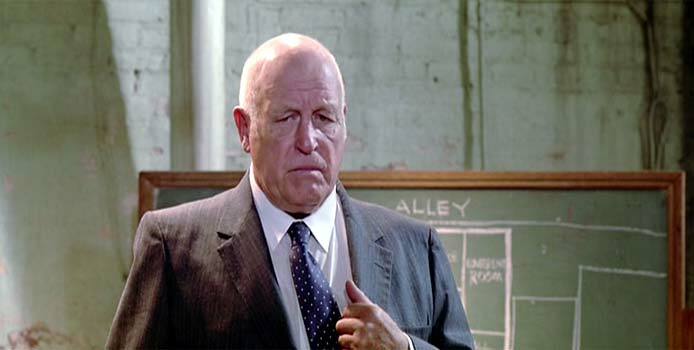 The film continues to unfold chronologically in the warehouse, but is intersected with the recruitment of each member of the team by veteran crime boss Joe Cabot (Lawrence Tierney). We discover Mr. Blonde has a history with Joe and his son Nice guy Eddie (Chris Penn). Mr. Blonde has just got out of prison, although he is hot headed and a live wire, he didn't squeal on his employers and served the maximum of his sentence. Back at the warehouse, Mr. White is furious with Mr. Blonde for his reckless, gun hoe attitude on the job. 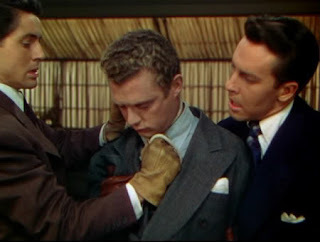 As they square off with each other, Mr. Blonde takes them outside to the trunk of his car to unveil a kidnapped police officer. Nice guy Eddie arrives at the warehouse as they begin to interrogate the officer and tries to handle the situation before his father arrives. He orders Mr. White and Mr. Pink to follow him as they dispose of the amassing cars outside and retrieve the diamonds. He leaves Mr. Blonde to guard the officer and Mr. Orange which, arguably the films most famous scene as he begins to torture the police officer. Mr. Blonde proceeds to slice the officer with his pocket razor and cuts off his ear, all the while dancing around sadistically to 'Stuck in the middle with you' by Stealers Wheel. The officer is saved by Mr. Orange who regains consciousness and shoots Mr. Blonde. In another flashback, it is revealed that Mr. Orange is in fact an under cover police officer. The rest of the force is ordered to storm the Warehouse only when Joe arrives. The movie climaxes dramatically with a four way showdown. Eddie arrives back at the warehouse with Mr. Pink and Mr. White, furious at Mr Oranges' make shift story that Mr. Blonde was going to kill them and make off with the diamonds. Joe arrives and is convinced that Mr. Orange is the rat as he was the only one on the team he wasn't 100% on. Mr. White defends Mr. Orange, calmly stating if Joe kills Mr. Orange, he dies next. Eddie angrily demands Mr. White to stop pointing his gun at his father as they all shoot each other. Writhing in pain, Mr. White cradles Mr. Orange who confesses he is the rat. Mr. White reluctantly puts a gun to his head as the police storm the building, he pulls the trigger and the police open fire. Quentin Tarantino first drew attention from his script for 'True Romance' directed by Tony Scott, but Reservoir Dogs catapulted him into the main stream. His snappy, gritty narrative is excellent throughout with spells of dark humour but always grounded in reality. Going against the grain of traditional movies and ending with a big reveal of the insider, Tarantino exposes him halfway through dramatically increasing the tension. "Mr. Tarantino not only can write superb dialogue, but he also has a firm grasp of narrative construction. The audience learns the identity of the squealer about mid-way through, but the effect is to increase tension rather than diminish it." (Canby, 2003). The movie is full of memorable scenes, including the opening introduction, numerous flashbacks of events leading up to the warehouse and most notably the 'torture' scene. "Tarantino exploits audience savvy, preferring to build anticipation, mesmerise, and then cut away at the climax, as in the infamous ear-severing scene. Somehow it's horribly effective and lingers far longer than the usual point blank bloodshed that seems compulsory in other movies." (Haflidason, 2001). Although this technique is not new, (e.g chainsaw scene in 'Scarface') it is extremely affective. 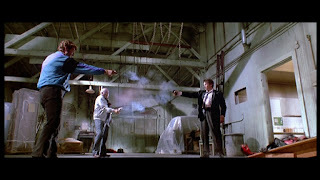 Tarantino is supported by excellent turns from Keitel, Buscemi and Roth who all excel in their roles. However his production staff no doubt had a hand in making his Directorial debut the success it is. "With cinematographer Andrzej Sekula's considerable help, Tarantino has but strong visual on the screen, alternating from ominously moving cameras to recessive long shots to put the action in relief. Sally Menke's extremely impressive cutting keeps scenes tight and the time-jumping plot comprehensive." (McCarthy, 2007). The complex time-line and superb editing makes the films relatively simple plot line completely immersible. Particularly with the father son bond that results between Keitel's Mr. White and Roth's Mr. Orange. Canby, Vincent. New York Times review. 20th May 2003. Melanie Daniels (Tippi Hedren) get's what she wants. 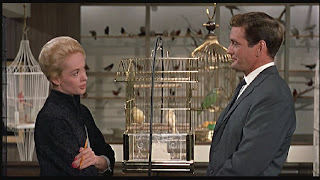 Socialite and daughter of a wealthy newspaper owner, she encounters a lawyer Mitch Brenner (Rod Taylor) in pet shop whilst buying a bird for her aunt. Mitch recognizes Melanie from a previous court hearing, but proceeds to ask her where the 'lovebirds' are, also as a gift for his younger sister. Melanie pretends she works at the shop, Mitch goes along with the prank but finally reveals that he knows her. Taken back, Melanie uses her fathers contacts to trace his number plate, tracking Mitch down at his family home in Bodega Bay. To settle the score she purchases two lovebirds and drives out of town to find Mitch.Whilst investigating the Brenner family, Melanie meets Annie Hayworth (Suzanne Pleshette), the local school teacher in Bodega bay, who informs her that Mitch's little sister is called Cathy. Annie recognizes that Melanie's intentions for Mitch are more than meets the eye. Melanie uses a boat to cross the river and sneaks the love birds into Mitch's home. On her way back she is the victim of a swooping seagull causing a gash to her head. Mitch races back to the dock after discovering the birds and tends to Melanie's wounds. Here she meets Mitch's mother Lydia (Jessica Tandy), who doesn't take kindly to Melanie, especially when Mitch invites her to dinner that evening. Not intending to stay, Melanie accepts the invitation and goes back to Annie's and rents a room for the night. That night it becomes clear that Annie and Mitch have a history together and he also teases her about a story published about her in the paper. Angrily she drives off. Back at Annie's home, Melanie receives a call from Mitch, apologizing for his behaviour and invites her back for Cathy's birthday the following day. Annie reveals she and Mitch were lovers and were driven apart by his dominating mother when they are interrupted by a bird flying into the front door, killing itself. At Cathy's birthday, Melanie begins to open up to Mitch, explaining how her mother ran out on her and her father. She is jealous of the close relationship Mitch shares with his, then all of a sudden, the children are attacked by seagulls but are saved by the adults without much incident. That night, multiple swifts fly down the chimney and attack the house again. Lydia takes Cathy to school, afterwards she drops round to her neighbour to check on him as they both are having problems with their chickens. To her horror, she finds him dead, victim of a bird attack with his body bloodied and his eyes pecked out. Distraught she drives home to Mitch and Melanie. Mitch and the authorities investigate the murder whilst Melanie comforts Lydia in bed. Lydia reveals her biggest fear is Mitch abandoning her after her husband died. Fearing another bird attack, Melanie offers to pick up Cathy from school. Melanie arrives at the school and sits on the bench outside to smoke a cigarette instead of disturbing their lesson. Menacingly, crows begin to gather on the children's climbing frame behind her. 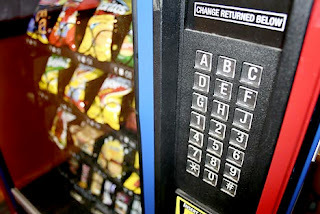 Melanie realizes another attack is imminent and rushes into the school to save the children. 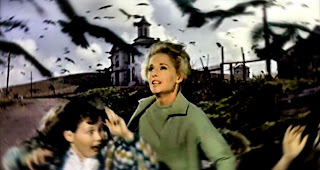 As they make their escape, the birds attack in a flurry, separating Melanie from Cathy and Annie. Melanie heads into town to the local cafe and is joined by Mitch, she calls her father to report the strange attacks. Locals overhear her conversation but dismiss it when all of a sudden the birds attack again, causing havoc. Cars crash off the road, people are pecked to death and the local petrol station blows up in the chaos. 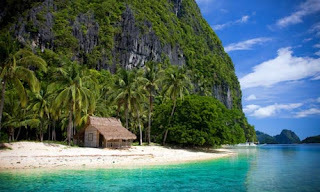 When the attack subsides, the locals begin to panic and one even blames Melanie for the attacks. Mitch and Melanie go to Annie's to pick up Cathy, only to find Annie's body dead on the porch. Cathy is safe in the house and explains Cathy saved her before she was pecked to death. They return to the Brenner home and Mitch boards up the windows and doors. That night, they are attacked again, trapped in their home, the birds manically smash into the doors and windows, Mitch rushes around to strengthen the doors and windows. Later that night, Melanie hears a disturbance upstairs. She discovers a hole in the roof and numerous birds roosting in the loft. She is subsequently attacked and injured but pulled to safety by Mitch. Badly wounded and in shock, Mitch decides to try and take her to hospital. 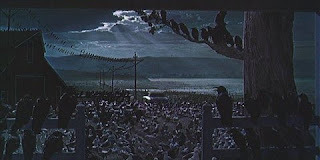 He opens the front door to see roosting birds as far as the eye can see. He gathers the family in the back of Melanie's car and drives through the birds. 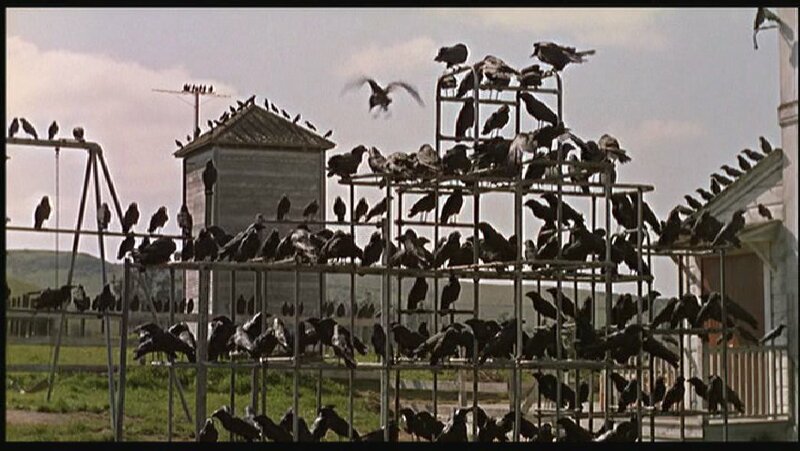 The Birds is one of Hitchcock's stranger films with a deliberate open ended close to the film. Advertised as a horror, it's more like a character study with bits of unexplained attacks from birds bolted on. 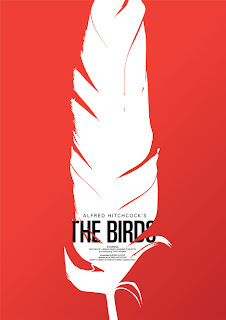 Compared with 'Psycho', 'The Birds' is much more allegorical and open to many interpretations. "Whether Mr. Hitchcock intended this picture of how a plague of birds almost ruins a peaceful community to be symbolic of how the world might be destroyed (or perilously menaced) by a sudden disorder of nature's machinery is not apparent in the picture. Nor is it made readily clear whether he meant the birds to represent the classical Furies that were supposed to pursue the wicked on this earth." (Crowther, 1963). Hitchcock explores complex relations with Freudian undertones between Mitch and his mother, love triangles with Mitch, Melanie and Annie and particularly the relationship between Melanie and Lydia. Lydia, throughout the film is threatened by Melanie, she only embraces Melanie literally and metaphorically after she is viscously attacked and weakened. 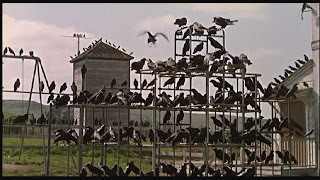 The Birds is filled with classic Hitchcock suspense, particularly with the gathering crows before the school attack. The pace of the film is dictated by this suspense, gradually increasing the length and severity of each attack, climaxing in the town frenzy. "These bird raids are captivatingly bizarre and terrifying." (Variety, 2007). Although the visual effects look a little dated now, the camera work and unique editing capture in exquisite detail the horror besieged on the town of Bodega. 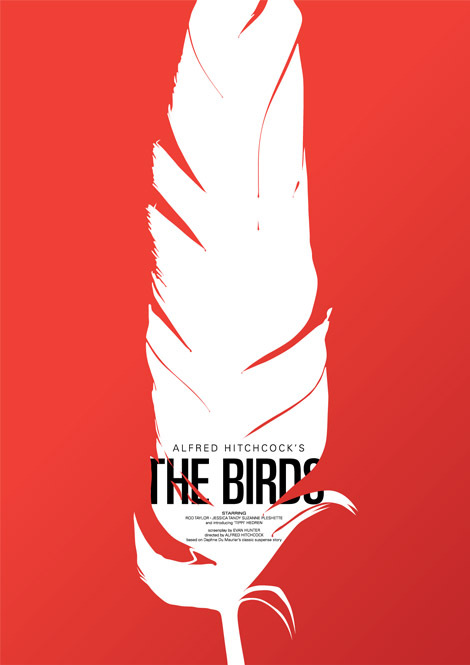 "...the film yields some of the director's most unsettling images: Hedren sitting innocently on a park bench, oblivious to the avian menace amassing on the playground climbing frame behind her; a seagull leisurely drifting into shot above a burning gas station; the camera homing in on the pecked-out eyes of a farmer in a series of nauseous rapid-fire edits." (Film4, 2007). 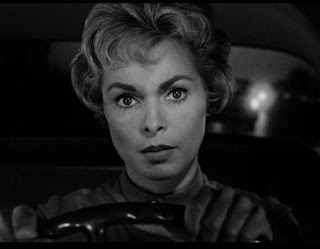 Marion Crane (Janet Leigh) is a devoted secretary working in a real estate office in Phoenix. She desperately wants to marry her out of town lover Sam Loomis (John Gavin), however, Sam feels he is unable to support her due to inherited debts and his own alimony payments. 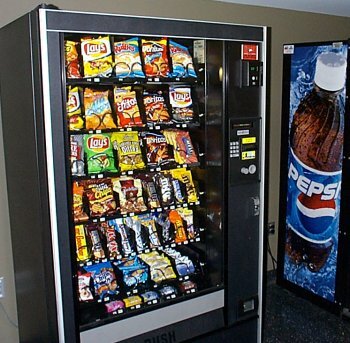 Marion returns to work after spending her lunch break with Sam. Her boss Mr. Lowry (Vaughn Taylor), shortly after returns with a client, Cassidy (Frank Albertson), an arrogant show off who boasts about buying a house for his wife with cash. He gives Mr. Lowry $40,000 who in turn asks Marion to deposit the money in the bank. Marion obliges and requests after she has paid in the money that she can return home as she has a headache. Marion never goes to the bank, instead she packs a suitcase and steals the money and decides to drive through the night to Sams. Marion is increasingly paranoid after her boss sees her leaving town. As she drives through the night she thinks about the conversations of the day and in the night pulls over to sleep. 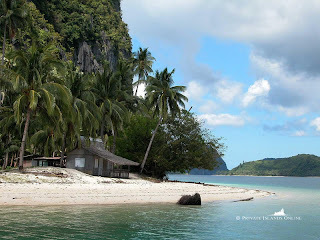 The next morning she is awoken by a police patrolman who checks her details but lets her go. She trades in her recognizable car in the next town and continues her journey. As the day turns to night, the weather begins to turn. In the pouring rain she stumbles upon a remote motel. At first it appears empty but she a shadowy figure of a woman in the window of the eerie house behind the motel. She honks her horn and a figure emerges from the house. 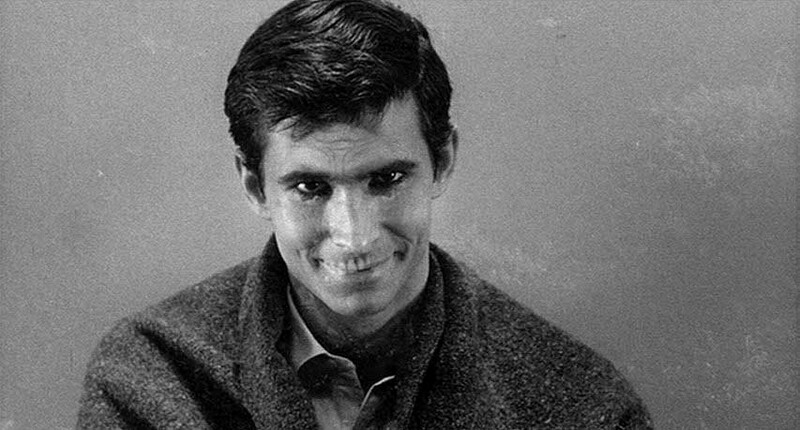 The figure is Norman Bates (Anthony Perkins), a young man who runs the hotel for his dominating mother. Norman seems reserved but polite and proceeds to check in Marion, inviting her to the house for dinner later. Marion retires to her room and over hears Normans mother shouting at him, rejecting Marions invite to the house for tea. Norman returns with a tray of sandwiches and milk and invites Marion into the parlor behind the check in desk. The room is filled with stuffed birds, a passion of Normans who begins to show anxiety after Marion apologizes for getting him into trouble with his mother. She finishes her tea and heads back to her room for a shower before bed. 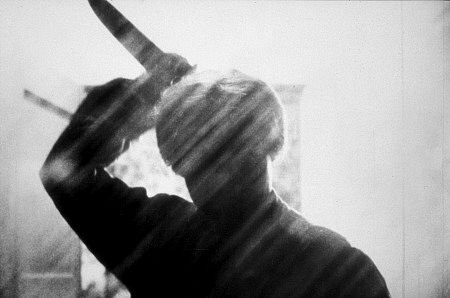 In the films most famous scene, a shadowy figure of a woman enters the bathroom and pulls back the curtain and strikes Marion several times with a knife killing her. The murderer hastily leaves and returns to the house. Norman is hear screaming "Mother, oh no, mother, blood, blood!" He runs out of the house and discovers Marions corpse. He uses the shower curtain to wrap her body and put it in the trunk of her car and dumps it in the swamp along with her possessions. 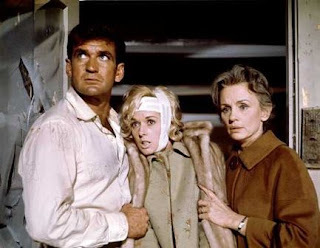 Meanwhile, Marions sister Lila (Vera Miles) tracks down Sam at his hardware store in search of her sister. She is closely followed by Private Investigator Arbogast (Martin Balsam) who has been hired by Mr. Lowry to track down Marion and the missing money. After questioning Sam and Lila, Arbogast periodically investigates various motel managers in search of her. He arrives at the Bates motel and interviews Norman and correctly surmises she was there and that Norman, or his mother maybe hiding something. He leaves and reports his findings to Lila and Sam stating he will return to question the mother. Whilst in the house searching for Norman and his mother, Arbogast is killed by a woman wielding a knife jumping from behind a door. When Arbogast fails to report back to Sam and Lila, they begin to get suspicious. They report to the local Sheriff who dismisses their concern and reveals that Normans mother committed suicide after killing her lover over 10 years ago. None the less, Sam and Lila investigate further and check into the motel under the guise of a married couple. Sam distracts Norman and allows Lila to search the house. 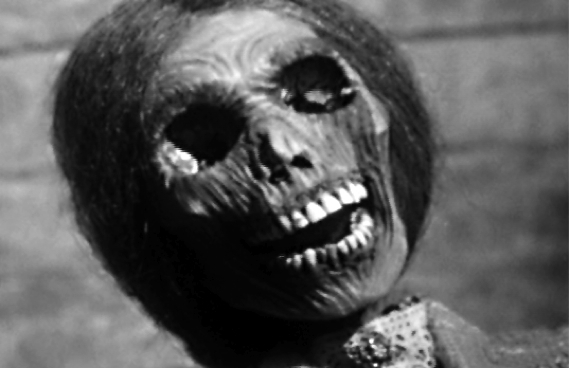 She discovers a woman sitting in the basement, which turns out to be the rotting corpse of Normans mother. Norman tries to kill Lila dressed as his mother but is thwarted by Sam. Sam and Lila are at the police station where Norman is being held. A psychiatrist emerges from his cell and explains to them that Norman suffers from a personality disorder. He reveals Norman murdered his mother and her lover and stole her corpse. To ease his guilt he developed a split personality, taking on the role of his mother. He could simultaneously be Norman and his mother, holding conversations between and sometimes the mother personality would take over completely. We cut to Norman sitting in his cell, his mothers voice dominating his thoughts, claiming she will show everyone who she really is someone who wouldn't even harm a fly. The movie closes with Marions car being dragged up from the swamp. Psycho is arguably Hitchcocks most famous movie. Endlessly parodied and imitated it is a landmark in cinema history. Made on a budget, it still encompasses Hitchcocks trademark close up shots, long takes and nerve shredding suspense. The opening act may seem overly long, but this only adds to the tension and suspense climaxing in the famous shower scene and shock reveal ending. " That's another little thing about this film. It does seem slowly paced for Mr. Hitchcock and given over to a lot of small detail. But when it does get her to the motel and apparently settled for the night, it turns out this isolated haven is, indeed, a haunted house." (Crowther, 1960). 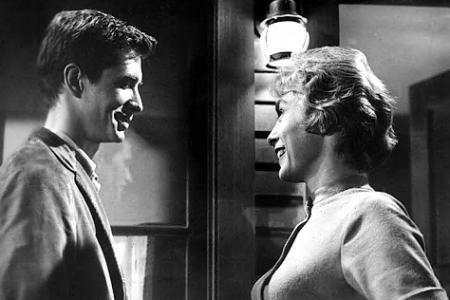 Psycho is unquestionably a horror film coated in a character study of everyday people. The shower scene is rightly regarded as the pinnacle of the movie, however it is in the tense build up to the motel that makes the film feel conceivable. Particularly when Marion is spotted by her employer as she is driving out of town with the stolen money. "Those few seconds, brilliantly economical and tense, are simply more psychologically convincing and real than anything else in this baroque, inspired shocker." (Bradshaw, 2010). Hitchcock has made a truly timeless movie in 'Psycho'. Not afraid to push the limits of what is and was sociably acceptable for the time with hints of his dark humor. Psycho re-defined the horror genre in a visually rich and detailed vision which manages to connect with everyday peoples fears. "Ostensibly a Grand Guignol thriller with Freudian undertones, it's a perfectly realised, visually rich, and chilling look at masculinity and schizophrenia that had more than a hand in redefining the role of the spectator in terms of mainstream cinema, most notably perhaps in the famous shower sequence which re-explored the nature of cinematic voyeurism." Wood, 2000). 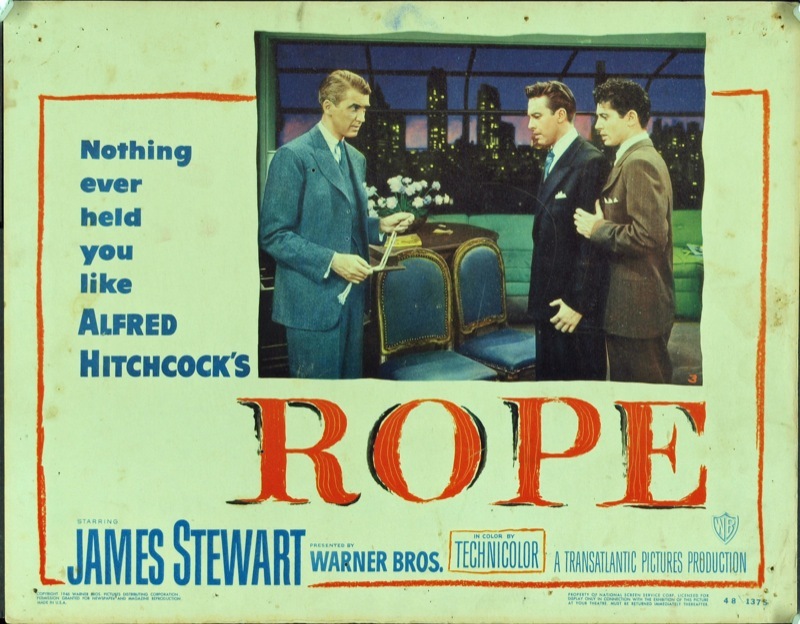 Set entirely in a New York apartment, 'Rope' opens with the murder of a young college graduate David Kentley. 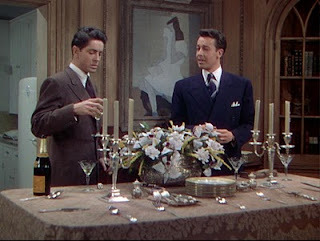 The perpetrators behind his murder are fellow classmates Brandon Shaw (John Dall) and Phillip Morgan (Farley Granger). Throughout the course of the opening act, we discover their motive is purely based on the belief they are intellectually superior to David and the 'average' man. Chief instigator and author of the insidious plot is Brandon who revels in his new found power whilst Phillip begins to show signs of regret and anguish. To save themselves disposing of the body in daylight and risk being spotted, they put David's limp body into an old chest. Adding insult to injury, we discover Brandon has arranged a house party that evening, the guests comprising of David's relatives, his fiancée Janet (Joan Chandler) and her former lover and their old teacher Rupert Cadell (James Stewart). Brandon insanely gloats they have made the perfect crime as they move the cutlery and ornaments from the dinner table onto the chest cruelly making David's relatives dine from his grave. The evening progresses and the guests arrive whilst Brandon and Phillip's maid Mrs. Wilson works away in the background. Brandon becomes increasingly more daring, dropping hints to Janet's former lover that David won't be part of her life any more. Phillip becomes more and more distressed, especially when Brandon reveals his beliefs to the room on culling the human population. The guests become more and more agitated over the disappearance of David meanwhile Rupert begins to piece the puzzle the together. 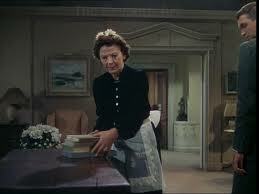 In true Hitchcock style, the suspense is ramped up to near excruciating levels as the guests converse whilst Mrs. Wilson begins to clear the cutlery from the chest. With each pile of books she brings back over to put away in the chest, the more the audience curiously wants Brandon or Phillip to prevent her from opening the chest. "...what is interesting is the way Hitchcock's sly amorality forces us, through the suspense, to side with the killers." (Andrew, 2006). After the guests have left and the murderous pair believe they have succeeded, Rupert returns claiming he has left his cigarette box in the flat. He has unfortunately for them, realized what they have done and retraces the crime and reveals he has found the rope they used to kill him. After opening the chest, Rupert manages to get Rupert's gun and fires shots out of the window, causing the public to call the police. The sirens approach as the three sit in the flat contemplating their fates. "Hitchcock could have chosen a more entertaining subject with which to use the arresting camera and staging technique displayed in Rope." (Variety staff, 2008). A curious quote from the variety staff as Rope is a hugely entertaining movie. Particularly for the time it was made, the subject matter was a risky move for Hitchcock. He does benefit from strong turns from Dall as the suave, psychotic Brandon and Granger is equally good as his murderous sidekick deteriorating with guilt. "Mr. Hitchcock has followed the goings and the comings of characters with evident ingenuity. His camera stands back and takes them in, singles them out on occasion and even moves in now and then for close looks." (Crowther, 1948). 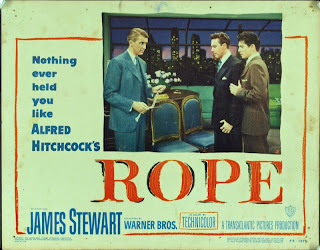 Rope is a unique movie and technically one of Hitchcock's greatest achievements. 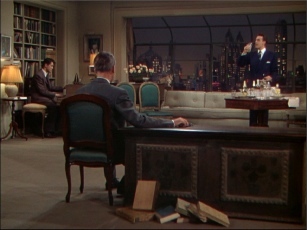 Based on Patrick Hamilton's play of the same name, Hitchcock pays tribute to theatre but demonstrates the power of cinema dropping the audience right in the middle of the action. The film feels like a theatre production with long takes and edited together to feel like one continuous take, the camera enables the audience to walk amongst the actors and set. 25 minutes, pencil, model walking in a circle. 25 minutes, pencil, model standing moving positions. 25 minute, pencil, motionless model. 10 minute, pencil, model rotating on the spot. 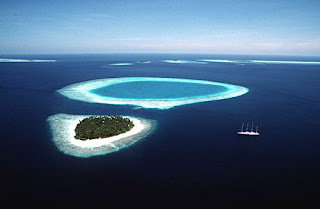 1) I pictured opening with a cartoon-like plane flying over the ocean. The plane is part of a travelling circus carrying the circus folk to their next show. On board there is some kind of commotion , causing the plane to crash "Castaway" style. 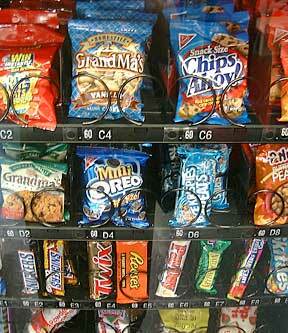 The contortionist is the only survivor. One day a vending machine washes ashore and using some other clown props, he uses it as a raft to escape. 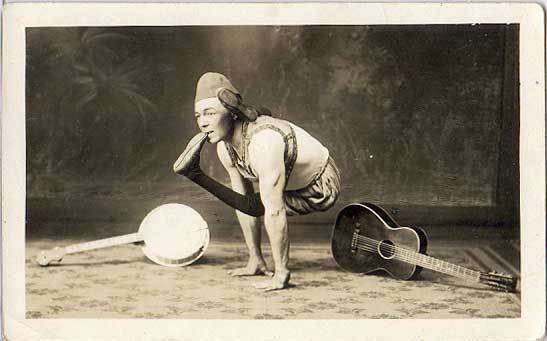 2) For my second idea, I really tried to think about my contortionist and what would give him / her more personality. Obviously contortionists are very flexible, young and fit. 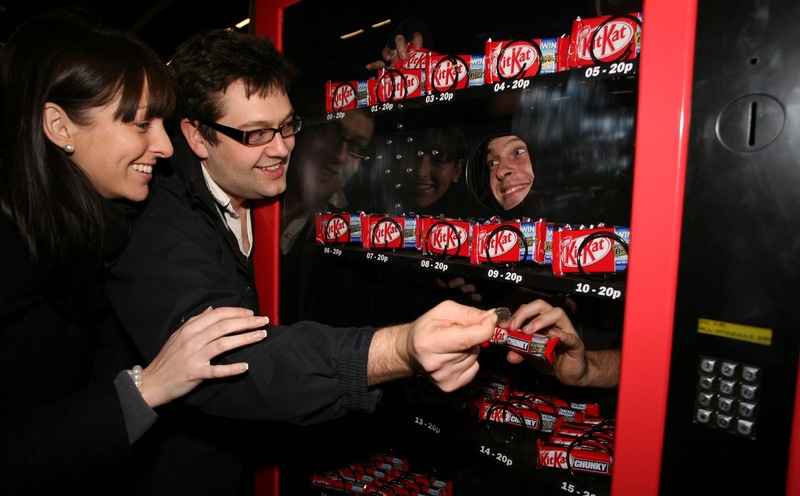 I thought it would be ironic if he or she was a retiring contortionist, old and frail who dreams of retiring to a desert island, but to do so must complete one last job of fitting into a vending machine. 3) Developing my character further, I thought of him as a criminal contortionist, who also dreams of retiring to a desert island. The minute animation will follow him on his last heist, but he get's caught out by the police, so he has to hide in a vending machine... certain jokes can derive from this. 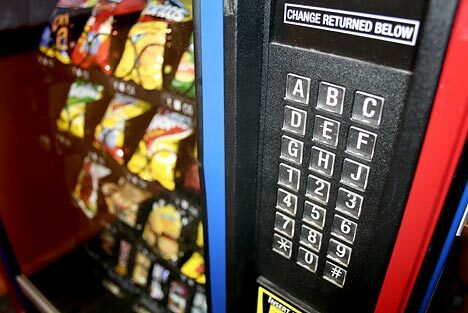 A police man could get something out of the machine not realizing he's in it. Interested to hear from other people and their thoughts. It's interesting to see how the story has evolved from just an initial chat with John. Any ideas welcome. For my storytelling unit, I have been told to pre-produce a one minute animation using three story components; a prop, an environment and a character.